There are a lot of strange “end times” beliefs in American pop-Christian culture. Some are rooted in long held interpretations of Scripture and some are rooted in Christian Bookstore fiction novels. In Jewish eschatology there is a belief that the Second Temple (destroyed in 70 AD) will be replaced by a future Third Temple. This view has not been shared by Christians for almost 2,000 years, until recently. Among a number of American Evangelicals there is a belief that in order for Jesus to return, a third Jewish Temple has to be built in Jerusalem. Is this a valid, new interpretation of Scripture? Or is this just a belief that stems from extra-Biblical influence? For the Jews, the Temple was the center of their worship. The Temple was the chief place of their sacrificial system. The Temple was their connection with God. Through the temple God dwelled with his people. Currently there is no Jewish Temple in existence. The first Temple, sometimes referred to as Solomon’s Temple, was destroyed by the Babylonians in 586 BC. After 70 years of captivity, Israel returned to the land and was able to rebuild their Temple. Then finally in 66 AD, as prophesied by Jesus, the Temple would be destroyed once again by Rome. Most Jewish-Orthodox scholars reject any attempts to build the Temple before the coming of their Messiah. Partly because there are many doubts as to the exact location in which it is required to be built, but mainly because they believe the Messiah has not yet come. For Christians, it is clear that the Messiah has indeed come and that he is Jesus. Before we examine what Scripture has to say about a Third Temple, it is important to understand what came before. After God delivered the Hebrews from slavery in Egypt he gave Moses specific instructions on how to build a portable tent structure. This was called the Tabernacle and it was where God dwelled among the children of Israel. Fast forward a around 300 years and now the people of Israel have their own land, city, and king. King David, while admiring his grand palace, remarks that he thinks that the Tabernacle should be turned into a grand Temple (2 Samuel 7:1-2). That night God spoke to one of king David’s advisers warning David that He never asked for a Temple and that one day He Himself would build a house for the Lord through His Son (2 Samuel 7:7, 11-13). Disobeying God, David started the planning and construction of the temple anyway (read more here about how the Temple was not God’s will). David’s son, Solomon, would complete the Temple based off of his father’s detailed plans. Hundreds of years would pass, the first Temple would be destroyed by the Babylonians and then rebuilt by the King of Persia 70 years later. According to the Babylonian Talmud (Judaism’s most holy book), however, the second temple lacked the “divine presence of God” that was present in the first (Yoma 22b). During the time of Jesus and the New Testament accounts, the Second Temple was still standing and being used as the center of Jewish worship. On Palm Sunday, one week before his death, Jesus prophesied the complete destruction of Jerusalem, including the temple. “If you, even you, had only known on this day what would bring you peace…” The Jewish people wanted a king who would raise up an army to violently overthrow the Romans. Jesus was not this type of king— he rode a peace donkey instead of a war horse, and he was killed for it. Jesus knew that the Jew’s lust for violence would spell their own destruction, and he wept. Jesus describes the destruction as so complete that not even one stone (of the temple) will be left on another. What Jesus prophesied came to pass in 66-70 AD. The Second Temple was wiped off the face of the Earth. To this day, there is no archaeological evidence of the second temple, only historical accounts. Jesus said to them, “Destroy this temple, and I will raise it again in three days.” They replied, “It has taken forty-six years to build this temple, and you are going to raise it in three days?” But the temple he had spoken of was his body. After he was raised from the dead, his disciples recalled what he had said. Then they believed the scripture and the words that Jesus had spoken. The very next day after he prophesied that the Jewish Temple would be completely destroyed, Jesus declares that the Temple will be rebuilt in three days. Interestingly, Scripture says he is referring to himself as being the Temple, which in Jewish culture signified the dwelling place of the Lord. But Jesus says, “I tell you that something greater than the temple is here.” (Matthew 12:6) Jesus is saying that his body is the Temple. Jesus is saying that he is the new Temple, rendering the previous ones obsolete, since he uniquely manifests God the Father. The ultimate, once-for-all-time sacrifice took place in this “temple” when others “destroyed” it, but Jesus rose from the dead in three days. 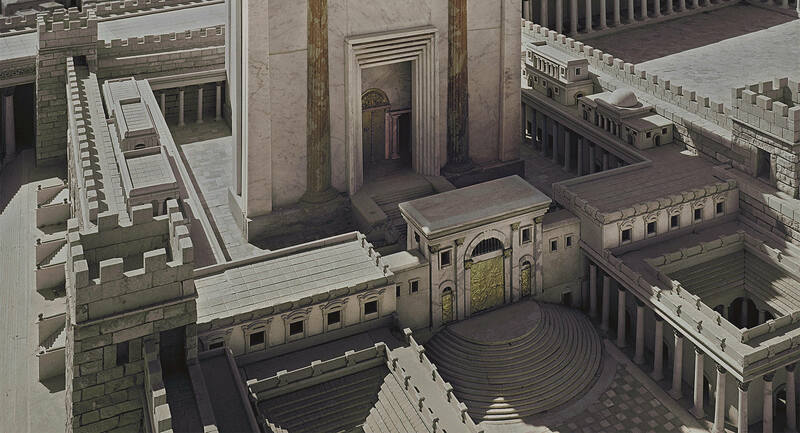 In Jewish life, the Temple was central to their whole existence. It was their world. If it was destroyed, it would be the end of their world. While the established temple powers were plotting the destruction of Jesus, Jesus was prophesying the destruction of the Temple, the Temple Age, and the Temple power structure. Their destruction wouldn’t come at Christ’s hands though, it would come from their own violent arrogance and disobedience. The center of Jewish worship was going to come tumbling down but God would not abandon his people. Several places in the New Testament refer to a new third Temple that is different from the first two. First, as we have seen, Jesus calls himself the new Temple that replaces the old ones. Though scripture doesn’t stop there. Look at what Paul says to the first century Corinthian Christians. Don’t you know that you yourselves are God’s temple and that God’s Spirit dwells in your midst… for God’s temple is sacred, and you together are that temple. This is just one of several passages that claim that Christians are the new Temple of God (2 Corinthians 6:16, 6:19; 1 Peter 2:5). What is incredible is that the promise that God made to David was finally fulfilled through Jesus Christ. God promised that He Himself would build a Temple, through his son. Even though David misunderstood and God accommodated it, with Jesus everything is put right. Finally, at the end of the New Testament in the book of Revelation the future of the Earth is described. So, from the Gospels we learn that Jesus is greater than the Temple. The Temple is Jesus’ Body. Since Jesus replaced the Temple, it is no surprise that at the moment of his death, the curtain in the Temple was torn in two (Matthew 27:51). From this moment on, God has changed the way in which he will relate to people: without the various barriers in the temple that symbolized degrees of access to God. A Third Temple was rendered obsolete by the tearing of the curtain. Jesus clearly told his disciples that the Second Temple would be destroyed, but he never talked about a Third 27Temple building being constructed or even needed. What is even more amazing is that Jesus claims that his body is the New Temple and Scripture says that Christians are his body (Romans 12:5; 1 Corinthians 12:12-27; Ephesians 3:6, 5:23; Colossians 1:18, 24). This is further confirmed by the numerous times that Scripture says that we are now the Temple. For almost 2,000 years of Christianity, no one expected there to be a physical third Temple building. There just aren’t any Scriptures that point out there being an expectation for one. Instead, so much of prophesy and God’s plan is revealed in Jesus and his body becoming the new Temple. In fact, to expect a third Temple building, is to disregard Jesus and the prophesies he fulfilled. The idea that a third physical Temple building needs to be built to usher in “end times” events is an invention of Zionism. God’s house in Jerusalem was meant to be a “place of prayer for all the nations” (Isaiah 56:7; Mark 11:17), but God would now finally achieve this through the new Temple, which was Jesus himself and his people. There is no need to expect another Temple.